Is there anything more delicious than a great pot roast? When it comes to pot roast, there are many approaches that you can take. You can add interesting spices. You can even cook it in red wine. All of these options are delicious, but for me, I like to keep my approach to pot roast as simple as possible, but I promise, though this roast is simple, it does not lack in flavor. Let me show you how I do it! Part of what makes this pot roast so simple is the fact that I am going to let it cook for hours in the slow-cooker. 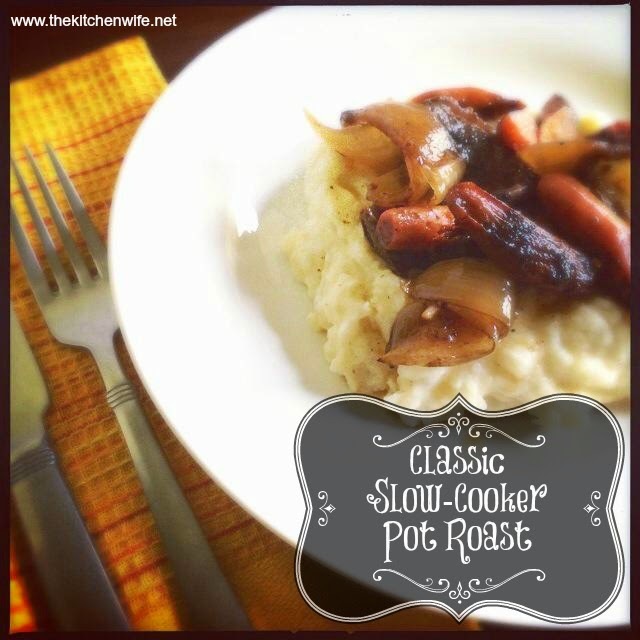 Slow-cookers are great for all you working guys and gals out there. You can have FANTATSTIC meals like this on any night of the week! And garlic powder on all sides. Then, over medium/high heat, get your skillet nice and hot. Add a little oil and sear your chuck roast for 2-3 minutes on all sides. This helps seal in all those succulent juices and create a nice, crispy outer crust. Once you have seared your chuck on all sides, place it in your slow-cooker. you can add the carrots to the pan. Allow the carrots 2-3 minutes to brown and caramelize. This enhances the natural sugars in them, and again creates a nice, sweet flavor. Once they are browned, place them in the slow-cooker as well. Now add the onions and do the same. Again, you will place those in the slow-cooker as well. brown bits in your skillet. THAT IS SOME SERIOUS FLAVOR! If you are using a boxed or can stock, pour it in the hot skillet now. this great, new product I have been using called beef base to the skillet. Now, use your whisk, to get all of those brown bits off of the bottom of your skillet. This will add so much depth to your already yummy stock. It is going to blow your mind. Now add the beef stock/broth to the slow-cooker. Let it cook for 8 hours. If you want, you can set it to high and let it cook for 4 hours. It is up to you and your schedule. After 8 hours, your roast will look a little something like this. enhancing your stock with those yummy bits have paid off. There is some SERIOUS flavor in here with the most succulent beef you have ever tasted. It will literally just fall apart. you can serve your family a pot roast that will rock their worlds! Give this a try tonight and I would to hear about and see those ecstasy shots on my Facebook Page! Season your chuck roast, liberally, with salt, pepper, and garlic powder on all sides. In a hot skillet, sear the chuck roast for 2-3 minutes on all sides. Remove from skillet and place in slow-cooker. To the skillet, add the carrots and allow to brown and caramelize for 2-3 minutes. Remove from skillet and add to slow-cooker. Now add the onions to the skillet and allow them to brown and caramelize for 2-3 minutes. Remove and add to slow cooker. To the skillet add the stock or water with bullion/base. Using a whisk, pick up all of the brown bits off of the bottom of the pan. Pour stock in the slow-cooker. Add the thyme and a sprinkle of salt and pepper. Plug the slow-cooker in, and set the temperature to low. Thanks for this new great way to cook my pot roast. Your time is well worth it for sharing your stuff. You are so welcome! Thanks for reading and cooking from the blog! I appreciate it so much!